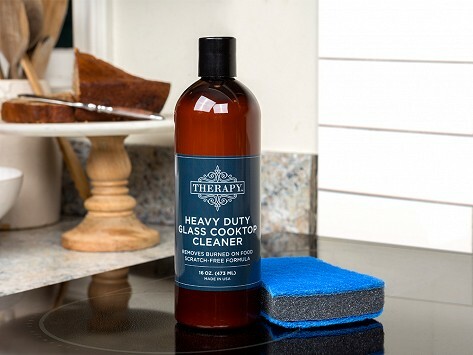 This glass cooktop cleaner takes a plant- and bio-based approach to cleaning up in the kitchen. The non-toxic, eco-friendly formula is made with a coconut oil-derived ingredient and calcium carbonate, a non-abrasive scrubbing agent also found in toothpaste. The cleaner removes messes like burned-on food and stains and leaves a streak-free, glossy finish in its wake. Essential oils provide a light, subtle fragrance. Made in the USA and includes a gentle scrubbing pad. This product does everything it says it does! Finally got my black glass stove top shining like new! It did so easily! Very happy with the cooktop cleaner. It works well and doesn't leave any residue. The song that came with it is amazing. This product is a keeper. It cleaned my cook top better than any other product I've tried. This products works better than any product I have used. Will buy again.